· - Balance load protection, overload protection, overload protection and short circuit protection. · - Protection ensures safety and optimal performance. · - Simple slide-out design, install or remove the battery in seconds. 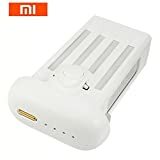 · Description: Product Category: Xiaomi 4K / 1080P Drone Battery Use for: Xiaomi 4K / 1080P Drone Weight: 0.7kg Color: White 1 * Original Xiaomi MI 4K Battery (5100mAh 17.4V) Features: - High quality - Easy to install Color deviation may differ due to different monitor settings. Please understand kindly. Tell us first when you have a problem, we will provide you with the best service and resolve the problem as soon as possible. Thank you very much.